Laura H. Bennett is the Multi-County Livestock Agent for Pasco, Sumter, and Hernando counties. 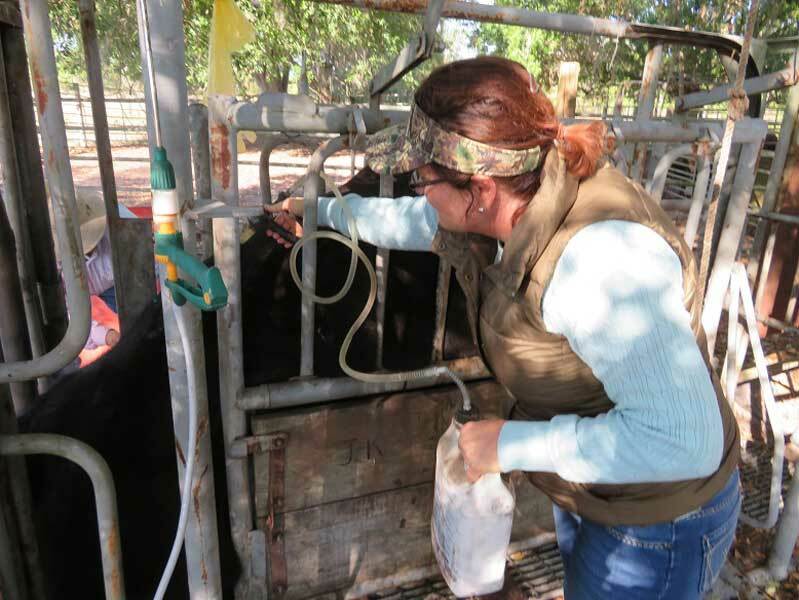 She shared her expertise in cattle handling at the 2018 Alvin C. Warnick Reproductive Management School in Manatee County in early November. In between sessions, she sat down for a wide-ranging Q&A — from how her job has evolved to what influences her approach to tips on the art of cattle handling. Q: How long have you been doing your job? I first worked in extension right out of the University of Florida for four or five years, then I left to raise a family and work with my husband in the agricultural industry. After 20 years, I just returned to the extension office within the last year. So I’m kind of an old person in a new job — I still get labeled as the new person again, but I bring a lot of experience. Q: How has the job changed from when you first did it until now? The biggest change from when I first started is the amount of reporting I do for the state. I have to show how I have saved someone money or how I have encouraged better practices when it comes to the environment. I have to show how I improve the livelihood of those I come in contact with. I need to show the impacts I make to not just the professionals, but to everyone I speak to, because these reports go to the state lawmakers who decide on agricultural funding, and so that makes them more critical than ever. Q: What advice would you give to someone just starting out in the cattle business? I always encourage people, especially those who are new to the cattle business, to make an effort to select cattle based on their temperament. Cattle have different temperaments and those who have a lower, or calm, temperament are generally easier to handle. One of the best things to do is to contact producers who have a reputation for breeding gentle cattle. It’s good to have referrals. While I wouldn’t endorse anyone specific with my role in the extension office, I could certainly help steer an individual to a list of people who would help them. Q: What are the top five tips you give for the art of cattle handling? Use the buddy system. Cattle are herd animals. They do not like to be alone. When putting them in new situations or in the cow pens, you never want to leave them by themselves. This concept also helps in moving them from one place to the other. They will “follow the leader”. Once you get the front of the line moving, their herdmates will follow. Just take it easy. Florida’s Brahman-influenced cattle can tend to be more excitable and stressed in many cases when dealing with people. Since cattle have long-term memory of stressful situations, it is very important to keep that in mind. Calm, easy, low-stress handling each time cattle are in the cowpens will pay off in safety of both the cattle and the cattle handlers. Stay in the Zone. A cow’s flight zone can be used to move cattle without causing too much stress. This is where the “art” of cattle handling comes in. It takes many years of practice handling cattle before it can become second-nature for someone handling cattle to be able to anticipate their movement. Shhhh … they can hear you. Cattle have excellent hearing and are very sensitive to noise. High pitched noises (including whistling) and loud, sudden noise tends to immediately cause a fear/stress response. Familiar, rewarding sounds can be calming. Think of a truck horn that blows to summon the cattle to range cubes. Each time the horn is blown, they are rewarded. Overcome some perceptions. Cattle have poor depth perception. They will easily balk at shadows, standing water, and even trash. By keeping this in mind, you as a cattle handler can anticipate these issues ahead of time and reduce potential stress for the cattle. Q: Where did you get your ideas? From the time I was in college at the University of Florida in the early 1990s, I have heard of Temple Grandin and her work in the study of livestock behavior. Her research revolutionized the techniques in handling cattle into something totally different. Using the principles she discovered, we can work with the cattle instead of putting ourselves in a situation where we work against them.